Inspired by the amazing true story of Winter. $19.152 million on 3507 screens. In the same vein as 1993’s Free Willy, 2011’s Dolphin Tale focuses on a boy and his aquatic mammal. Already a lonely, essentially friendless kid and sensitive to issues of abandonment due to a deadbeat dad, Sawyer Nelson (Nathan Gamble) finds himself even more depressed when the older cousin he adores (Austin Stowell) leaves to enter the Army. Sawyer’s life takes a major change when he finds an injured dolphin on the beach. He calls the authorities and a marine animal rescue team led by Dr. Clay Haskett (Harry Connick, Jr.) arrives to help. They take away the female dolphin to rehabilitate her. One major problem arises: the trap caused a lot of damage to the dolphin – named “Winter” by Haskett’s daughter Hazel (Cozi Zuehlsdorff) – and her tail seems too harmed to heal. Dr. Haskett needs to amputate the ends of her infected tail, but these leaves Winter with grim prospects since she can’t swim in a healthy manner. Along the way, Sawyer has become a fixture at the aquarium, and Winter responds positively to his presence. He refuses to accept her negative fate, so he looks to find a solution. His idea: contract prosthetics expert Dr. Cameron McCarthy (Morgan Freeman) to take a chance and build a functional tail for Winter. Since I’ve not seen it in decades, I don’t recall how I reacted to Free Willy. I seem to remember that I thought it was okay but nothing special – I expect it was decent but unexceptional kid-oriented inspirational fare. Given this review, I won’t have to wonder years from now what I thought of Dolphin Tale: I didn’t love it, but I liked it more than I expected. The film’s trailers highlighted its syrupy, “magical” tone, and that made it look like glossy goop. Which I admit it can be at times. Tail comes with some dark elements, but it’s pretty peppy and perky most of the time – and I don’t have a problem with that. After all, it’s meant to be family-friendly material that leaves you warm ‘n’ fuzzy at the end; as long as it doesn’t suffer from an excess of schmaltz and sentiment, I’m fine with its “G”-rated tone. I’m less happy with the movie’s 113-minute running time, as that seems awfully long for fare such as this. The biggest problem comes from the subplots added for potential dramatic tension. One of these concentrates on an injury Sawyer’s cousin Kyle suffers during military duty, and the other relates to financial woes experienced by Dr. Haskell’s aquarium. Tail doesn’t really need either of them, as it boasts more than enough natural drama without these choices. If the film had opted for just one of those threads, I’d not mind as much, but the presence of two stabs at artificial tension bogs down the narrative. Why not trust that the viewers will be involved enough in the basic “boy meets dolphin” relationship and leave the extraneous components out of it? Even with those missteps, Tail still conveys a warm tone and a fairly enjoyable inspirational drama. Gamble grounds the film surprisingly well as Sawyer; he never submits to the role’s melodramatic moments and he manages to keep the character pretty honest. Freeman provides a fun take on the scientist, and the others in the fine supporting cast add depth to the proceedings. At no point does Dolphin Tale threaten to become classic family fare, but that’s okay. It still manages to create a likable, warm inspirational story that does a lot more right than it does wrong. Dolphin Tale appears in an aspect ratio of approximately 1.85:1 on this Blu-Ray Disc. No issues emerged in this satisfying presentation. Sharpness worked well. Virtually no softness appeared, as the movie was always crisp and accurately defined. No issues with jagged edges or moiré effects occurred, and edge haloes failed to appear. Source flaws also remained absent. Colors looked good. The image took on a slightly golden tone much of the time, but the image stayed with a pretty natural impression. The hues seemed vivid and full. Blacks appeared dark and tight, while shadows showed nice delineation. Across the board, this was a strong image. I thought the DTS-HD MA 5.1 soundtrack of Tale fine for this sort of film. The mix did a good job with the various aquatic settings and brought them to life in a convincing manner. In the forward channels, the music provided nice stereo separation and opened up the mix reasonably well. Beach and aquarium scenes used the elements in a positive way that allowed the back channels to add pep to the proceedings. A hurricane offered the most immersive segment, as it created a convincing storm. Audio quality appeared good. Dialogue was consistently warm and natural, without edginess or problems. Effects seemed appropriately clear and accurate, with good range and punch. The music worked quite well, as the score and songs were pretty peppy and warm. Nothing here really impressed, but it all sounded good enough for a “B“. 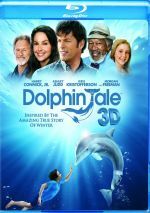 In addition to the 2D image discussed above, this package includes a 3D version of Dolphin Tale. Shot with 3D cameras, I thought this presentation added some nice dimensionality to the film. Much of the movie concentrated on general depth, but occasional shots brought out more impressive visuals. In particular, aquatic sequences impressed, as they allowed the viewer to feel immersed in the watery settings. Tale wasn’t the most dynamic 3D image I’ve seen, but I felt it complemented the story in a pleasing manner. When we head to the set’s extras, we start with two animated shorts. We get “The Hutash Rainbow Bridge” (2:26) and “Ormie and the Cookie Jar” (3:59). “Bridge” is actually a deleted scene embellished by some cheap animation; it shows a segment in which Dr. Haskell tells a fable to Sawyer and Hazel. “Jar” has nothing whatsoever to do with Dolphin Tale and just offers a comedic piece in which a pig tries to get to a cookie jar. Both are decent but unexceptional. Three featurettes follow. At Home With Winter goes for 13 minutes, 22 seconds and provides comments from producers Richard Ingber, Andrew Kosove and Broderick Johnson, trainer Abby Stone, Clearwater Marine Aquarium CEO David Yates, director Charles Martin Smith, executive producer Bob Engelman, production designer Michael Corenblith, and actors Morgan Freeman, Harry Connick, Jr., Ashley Judd, Nathan Gamble, Austin Stowell, Cozi Zuehlsdorff, Austin Highsmith, and Kris Kristofferson. “Home” looks at characters and story, using the real Winter in the film, sets, and shooting on location, and other notes. The featurette is pretty perky and glossy, especially during its opening moments. However, it eventually digs into some useful material. It never turns into anything packed with data, but it offers a decent look at a few aspects of the production. Spotlight on a Scene runs seven minutes, seven seconds and gives us info from Smith, Kosove, Ingber, Johnson, visual effects supervisor Robert Monroe, animation supervisor David Bass, effects supervisor Warren Lawty, and CG supervisor Terry Bradley. The program examines the movie’s underwater opening and aspects of its creation. It’s meatier than the first featurette and gives us a solid glimpse of the topic. Finally, Winter’s Inspiration fills 18 minutes, eight seconds with notes from Yates, Stone, Johnson, Ingber, Smith, Connick, Kosove, Highsmith, Freeman, Judd, writer Noam Dromi, amputees Damon Zigler, Andrew Hall and Maja Kazazic, and Hanger Prosthetics’ Kevin Carroll and Dan Strzempka. 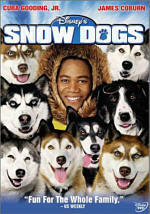 The show examines the real story of Winter and lets us know the facts behind the movie’s fiction. It’s great to learn more about this subject, and “Inspiration” covers the basics well. A Gag Reel comes next. It gives us a two-minute, 49-second compilation that comes with the usual silliness and laughing. Nothing particularly interesting materializes. One Deleted Scene arrives as well. “Winter Meets Panama” goes for two minutes, 21 seconds and shows Winter’s first encounter with another of the aquarium’s dolphins. It’s not a bad scene but I don’t think it would’ve added anything to the final film. The 2D disc opens with an ad for Joyful Noise. The 3D platter includes a promo for Green Lantern. No trailer for Tale pops up here. Films under the banner of “inspirational family fare” tend to inspire more nauseated gags than contented sighs, but Dolphin Tale usually stays on the positive side of the ledger. 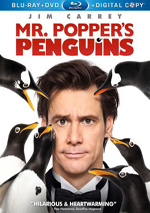 Despite some sags and missteps, the movie delivers a warm, enjoyable experience. The Blu-ray offers excellent visuals, good audio and average supplements. 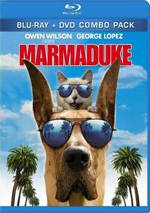 If you’re looking for a nice family film, this one’s worth your time, and the 3D version adds a fun way to watch it.